Born in Galesburg, Illinois, Aug. 25, 1910, Dorothea Tanning became a leading Surrealist painter beginning in the 1940s in France. Her work focuses on adolescent sexuality and also explores the unconscious and the irrational. She has lived a long life and continues in her 90s to make paintings and sculpture. Her first solo exhibition in America was not until November, 2000, and was held at the Philadelphia Museum of Art. 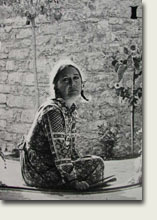 She attended Knox College in Galesburg for two years and after several years of traveling, settled in New York City and became a member of the Surrealist group that exhibited at the Julian Levy Gallery. She also produced stage and costume designs for the Ballets Russes de Monte Carlo and the New York City Ballet. In 1948, she married artist Max Ernst, whom she met when he came to her New York studio to look at her work. They had a double wedding with Man Ray and Juliette Browner, and Tanning and Ernst were married until his death in 1976. 1953 Six Artists: Gouaches, Acquarelles, Livres d'Art, Galerie René Drouin, Paris.